Results of new research on how healthcare professionals learn about continuing medical education activities and what they say makes them worthwhile to attend. Your continuing medical education activity has the top subject matter experts talking about the hottest topic in your clinical area—but you still can’t get healthcare professionals to sign up. What gives? MeetingsNet partnered with Charge Ahead Marketing and SK&A to find out what influences HCPs’ decisions to attend a CME activity, the types of activities they prefer, and the best way to communicate with them about CME offerings. Here are key findings from the study that will help you market your CME/CE programs more effectively. 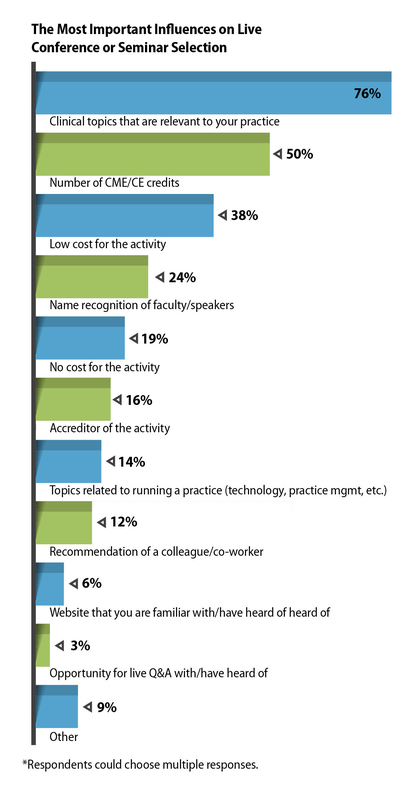 Almost 80 percent say live conferences and seminars are the medical education and training format they participate in most. It was also hands-down the format they say they most preferred, according to 56 percent of respondents. Online multi-day or multi-week online courses also scored highly, with 57 percent saying they get CME through that medium. On-demand webinars are popular with about a third of respondents, while 29 percent say live grand rounds are high on their educational agendas. The format that comes in lowest on the preference list is online grand rounds. While almost 12 percent say they participate in them, no one marked this as a format they most prefer. 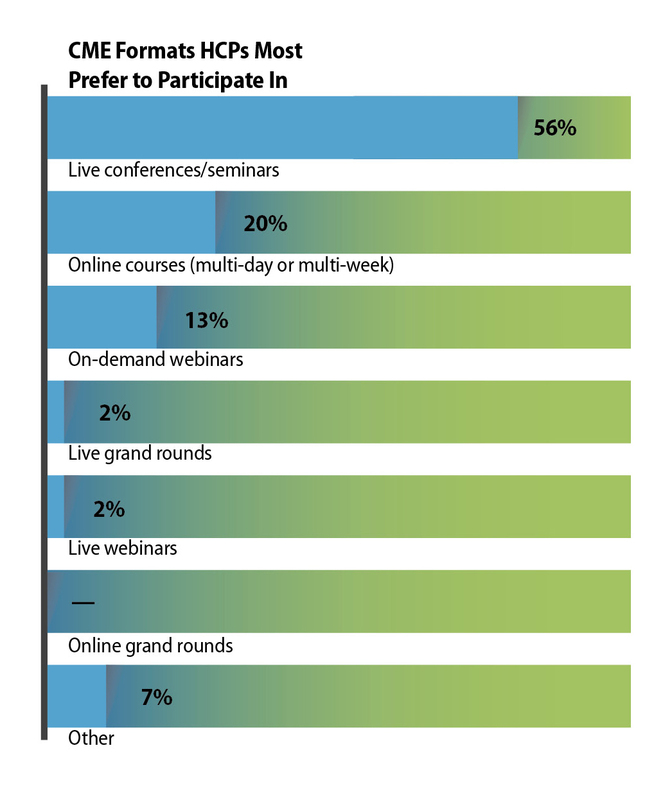 And while a quarter say they participated in live webinars, only 2 percent say they want to get their CME that way. What’s the best way to reach potential attendees? While 68 percent of respondents say email is how they usually hear about CME/CE programs, “The statistic itself doesn’t reflect the competing demands of the inbox,” says Laudenslager. “It is a challenge to gets emails delivered, opened, read, and clicked.” Instead of using email strictly as a way to acquire registrants, it is much more effective when used as a tool to nurture relationships and provide ongoing value through content, he says. “Use what you know about customers and make your email relevant. Have they accessed content on a certain topic? What do you know about their age, profession, employer, location, education level, interests? When have they visited your website or clicked on an email? Use that information to tailor your email content. That is how you get your emails opened, links clicked, and actions taken,” he says. 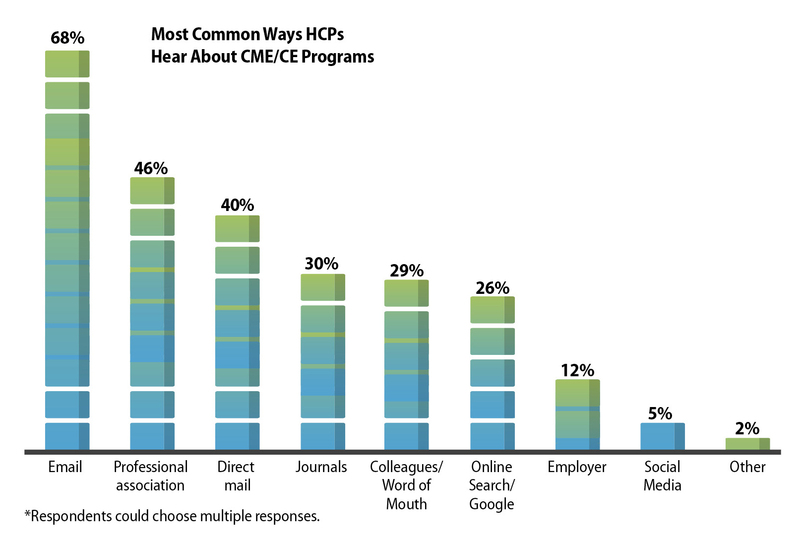 Communications from professional associations also rank high on the list of common ways HCPs find out about CME activities, at 46 percent, followed by direct mail, journals, word of mouth, and Google searches. At the bottom of the list are employers and social media. In fact, when asked the primary way HCPs learn about CME/CE programs, online searches jump from sixth place to third. “Today, it is important to invest in and understand search engine marketing, search engine optimization, and content marketing,” says Laudenslager. “These tactics are cost-effective and provide a sustainable return for your marketing budget.” While journals are the fourth most common way HCPs hear about CME programs, only 3 percent say this was a primary source for them—“Journals are a non-factor related to CME and education,” says Laudenslager. Keeping the cost proportional to the perceived value also is key. While 21 percent say they don’t have to pay any out-of-pocket expenses for their CME/CE participation, a third say they pay for at least half—almost a quarter say they are on the hook for more than 75 percent of the costs—and 61 percent pay for at least 10 percent of it. But whether they pay out of pocket or not, HCPs still need to be convinced that the value they’ll get is worth the expenditure. “It’s important to focus on the benefits—things like the cost versus the number of CME/CE credits, comparative analysis between your events and your competitors’ events—to help participants justify the cost of participation,” says Laudenslager. How Important Is CME/CE Credit? More than half of HCPs say CME/CE credit is a key deciding factor—second only to the relevance of the clinical topic. Also, 62 percent of the HCPs surveyed participate in social media, which for Laudenslager signals the need to make social media a meaningful part of your marketing strategy. “And not just by putting up self-serving content. You have to create compelling content. Algorithms from Facebook and Google changed, for example, to prioritize content that people actually engage with. Content that gets liked, shared, commented on, etc. Without that engagement, you get very low organic reach.” He adds that social media also can be a valid paid advertising option, though costs are increasing. Data was collected via an email survey in fall 2017 to a wide range of U.S. healthcare professionals. The 129 usable responses were analyzed by Informa Engage Research, the research arm of Informa, MeetingsNet’s parent company. Physicians comprise 73.4 percent of respondents, which also included nurse practitioners (11.7 percent), physician assistants (9.4 percent), nurses (0.8 percent), and other HCPs (4.7 percent). The majority—83 percent—were between 35 and 64 years of age, fairly evenly split between the 35–44, 45–55, and 55-60 age brackets. Just under 8 percent were 65 or older.